Since our magazine’s inception in 1954, we at Toyon have stated a shared goal to present an “unpretentious ‘literary newspaper’” of sorts. In broad strokes, this means we have tried to curate an inclusive and accessible magazine since its creation, though we haven’t always been successful. Due to the rotating staff of students and the nature of a collaborative editorial structure that Toyon implements, many individuals bring their visions to the drawing board, causing changes in the types of content published over the years. Many of our earlier issues contain content that we would no longer be comfortable publishing, due to the sexist and otherwise hateful messages some stories contain, straying from the original editorial team’s goal of “unpretentious” literature. But it is indeed part of our history and for that reason we will not forget it. This change in published content Toyon has seen has been accompanied by a changing subtitle and tagline. Various incarnations have included language such as “Toyon Review”; “Toyon: A Journal of Poetry and Fiction”; “Toyon: Journal of Creative Works”; “Toyon Multilingual Journal of Literature and Art”; and a handful of others. These subtitles typically leave out the word “Literature”, as it is a term that comes packed with a history of elitism. While it is difficult to determine what former staffs thought of the ideas of inclusivity and accessibility, the 2018 staff believes we can easily co-opt the institution Toyon has become in order to guide the magazine into a new, better era. It is for this reason that, moving forward, the current and future Toyon staff will remember the magazine’s history, while striving to bring the magazine into a more inclusive space. By changing the brand of Toyon to become one that retains its high quality work, all the while being approachable to a wider audience. 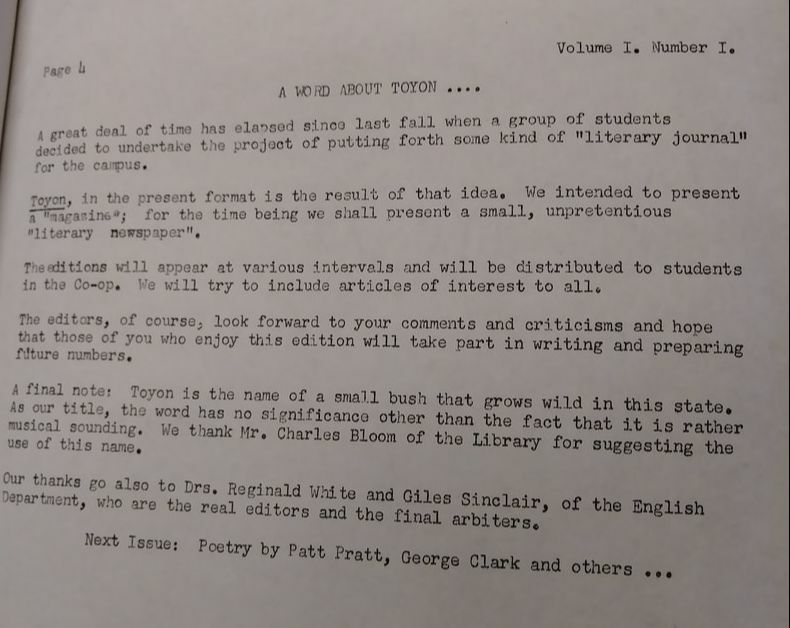 Letter from the editorial team, 1954, premiere issue. Expressing the desire to create an “unpretentious” newspaper.